Feb. 1976 Began Shorinji-Kenpo training in Tokyo. Feb. 1984 Acquired Shorinji-Kenpo 4th dan. Oct. 1985 Established a Federation of Shorinji-Kenpo dojo in Koenji, Tokyo and assumed position of Branch chief. Mar. 1993 Resigned from Ginza Adams Co.
Apr. 1993 Established Le Garage Adams Co.
Aug. 1996 Withdrew amicablyfrom Shorinji- Kenpo and resigned as Branch chief. 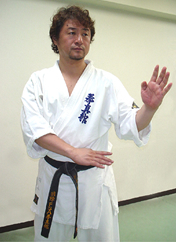 Oct. 1996 Founded F.S.A Kenshinkan and assumed position of Kancho (Director). Oct. 1997 Opened dojo headquarters. Renamed F.S.A Kenshinkan to International F.S.A Kenshinkan Karate Organization. Jul. 2001 International F.S.A Kenshinkan is incorporated as a private company. May 2007 Established CHAOS Promotion. Nov. 2007 Established International CHAOS Association.